Martin-Baker has now supplied 500 US16E Ejection Seats to Lockheed Martin for the F-35 Lightning II aircraft, spread across the three production lines: to Fort Worth, to Leonardo Cameri and to Mitsubishi Heavy Industries Nagoya. LM UK CEO, AM Peter Ruddock CB CBE (himself a Hunter Mk2H ejectee in 1977), commemorates this significant milestone with Andrew Martin, Martin-Baker VP Business Development. November 2018 saw the production of the 2000th JPATS (Joint Primary Aircraft Training System) ejection seat for the highly successful Textron T-6 Texan II trainer programme. The first flight of this remarkable aircraft took place in July 1998. Now over 700 aircraft are in service with US armed forces alone, with a further 9 countries ranging from Iraq to the UK using this aircraft as part of their training systems. Martin-Bakers involvement with this programme started with the need to accommodate a very wide size and weight range to a higher physiological acceleration standard than designed for earlier seats. Previously the combined weight of the heaviest crew member and the seat was about 20% more than that of the lightest crew with seat. The requirements for the new seat saw an increase in this requirement to 50%. Even with this extended requirement 11 T-6 crew members owe their lives to the outstanding US16LA JPATS Ejection Seat. The low seat weight requirement, very wide crew weight range and the fact that this seat met the new stringent physiological limits are testament to the design skills of Martin-Baker’s engineering staff. In the November 26 edition of Forbes online, Loren Thompson, a contributor to Forbes and Chief Operating Officer for the non-profit Lexington Institute, wrote an uninformed OpEd titled Air Force Push for Better Pilot Protection Upsets Competitive Landscape in Ejection Seats. In it he describes many items that should have required data to back up his assertions, but fell short of meeting a journalistic standard of integrity. In fact, instead of seeking comment from Martin-Baker, whom he wrongly took to task, he casually emailed us to mention he had posted it online and then offered us the opportunity to speak with him after the fact. We would like to take a moment to dissect exactly what Mr. Thompson wrote and exactly what the facts are. First and foremost, before we begin we must give Thompson credit for admitting the Lexington Institute receives financial contributions from United Technologies, the company he cited who are the main competition with Martin-Baker. With that, let’s examine what was written and what the facts really are. 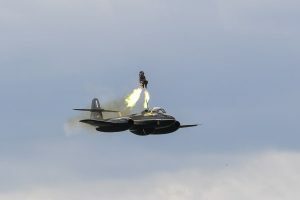 We note that the reason why the United States Government needs to buy a next generation ejection seat is that the manufacturer of the current ACES II seat, UTAS, has invested little-to-no money of their own to improve the seat as it has aged, and made changes only through Congressional earmarks and sole-source contracts. In stark contrast, in order to be competitive, Martin-Baker has invested heavily in the research and development of its ejection seat technology as illustrated with its extensive test facilities and test programmes. This investment underpins why Martin-Baker ejections have been so successful in US service – T-45, F/A-18, T-6, T-38 and the very recent F-35 ejection. Martin-Baker test programs have demonstrated compliance to Air Force requirements. Martin-Baker has conducted far more USG-audited tests than UTAS and has test data that shows performance far superior to UTAS products, which is why Martin-Baker is in hundreds of US and US-allied airframe types around the world while UTAS has been limited to US, or US Foreign Military Sales awards. 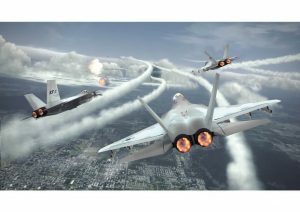 Thompson wrote: The Air Force wants to be able to protect a wider array of cockpit occupants when they must eject in future emergencies, because the people piloting its combat aircraft are increasingly diverse. Some are smaller women, some are heavy-set men. All will likely be wearing head gear and other equipment that exposes their bodies to potentially severe injury when they eject, unless the performance of ejection seats is improved. Martin-Baker was the first company, with the T-6 program in 1993, to demonstrate the ability to accommodate the full USAF Anthropometric range. 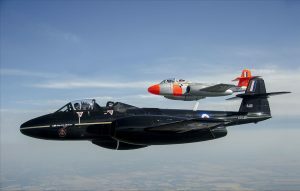 Lack of investment by UTAS has left the 1970’s technology ACES II Seat far behind to the detriment of the USAF aircrew. Thompson wrote: United Technologies Aerospace Systems, a modest contributor to my think tank, has repeatedly expressed confidence that it can achieve Air Force safety goals with a new version of its ejection seat called ACES 5. As the seat explosively exits an aircraft, it protects occupant heads from twisting, and it restrains arms and legs from flailing. It also reduces the velocity at which ejected personnel hit the ground. These stresses have led to severe injury and even death in the past. Roughly 48 percent of ejection injuries are caused by parachute landing fall, not the ejection sequence. UTAS is only now developing a new parachute, and only for the very first time – evident by the crude use of reefing line cutters to control inflation of their hemisflo main parachute. Contrast this with continuous parachute development for Martin-Baker systems within the T-6, T-38 and F-35 Seats. Martin-Baker has cleverly used the aeroconical parachute design to reduce parachute inflation loads for the smallest occupant while simultaneously reducing the descent velocity for the heaviest occupants. Additionally, Martin-Baker Seats have incorporated limb restraints for many decades – the ACES II has none. Martin-Baker were also the first to develop and qualify head and neck protection devices back in 2005. We have 13 years of extensive ejection testing that has fielded the 3rd generation neck protection device on the Mk18 Seat. Thompson wrote: Heavier head gear and a more diverse pilot population will make injuries more likely in the future — unless safety standards are raised. In fact, one former pilot told me that if pilots were to eject today wearing a heavy helmet-mounted display, they might die due to the unusual stresses imposed on their head and neck. The Air Force recognized the danger years ago, and formulated new requirements that would better enable ejection seats to protect their occupants – not just from crashes, but from the consequences of ejecting at high speed. Martin-Baker are well aware of the dangers of ejecting pilots whist wearing heavier helmets. We are still the only company who have a proven, qualified product capable of performing this task, and it has been proven to work safely during the recent F-35 crash at Marine Corps Air Station Beaufort. Additionally, we meet or exceed that requirement. In fact, the technical order and pilot’s manuals discuss the dangers of ejecting above 450 knots with helmet-mounted NVGs and Helmet-Mounted Displays. We have proven through testing it can now be done and have actual results that show our system works better than predicted models. No ejection seat in history has withstood more review, testing or stringent requirements than the F-35 escape system, which UTAS was incapable of winning in a fair, open and honest competition. UTAS discusses a “softer ride,” for the pilot to achieve reduced head and neck loads per the Neck Injury Criteria. That clearly puts pilots lives at higher risk when hundredths of seconds are the difference between life and death. Martin-Baker believe we can safely eject a pilot AND provide better terrain clearance. No aviator would sacrifice terrain clearance for a softer ride in a life-or-death situation. Thompson said: So why issue a request for inputs from industry if the new safety standards are essential to pilot safety? The reason, apparently, is that the other prospective offeror may not be able to meet the standards, and is seeking relief from their requirements. That company is Martin-Baker, a family-owned British company that has been active in the ejection-seat market since before World War Two. This is a comment without facts – Martin-Baker has always questioned elements of new standards to ensure we know the requirements exactly. In this case, a requirement called MIL HBK 516C was questioned because it is not formally published by the US Govt. When a requirement is not formalized, is it a requirement? It is always prudent for Martin-Baker to strive to achieve the intent of the customer. Thompson said: Martin-Baker claims on its web-site that 7,591 lives have been saved worldwide using its ejection seats. However, not every survivor walks away from an ejection experience. Many pilots sustain injuries to their spinal column and extremities, some of which are permanently disabling. Being explosively ejected from an aircraft traveling at 600 nautical miles per hour is intrinsically dangerous. What worries the Air Force is that it is becoming more dangerous due to both demographic and technological trends, and ejection-seat design has not kept up. 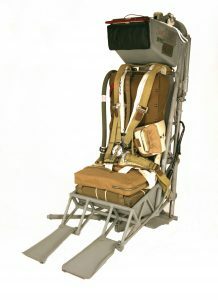 UTAS ACES II Seats have certainly not kept up with investment in escape technology – the lack of high speed ejection capability, the lack of limb restraint, the use of old 3-mode sequencers, the performance of the CKU-5 catapult and C9 parachute, and the 2 point drogue design are just some examples. Thompson says: The Air Force request for information is an opportunity for Martin-Baker to explain why more stringent safety standards may not be realistic. However, in the process, the company could end up conceding it can’t meet standards that its main competitor says are achievable. If that were the case, it would decisively favor the ACES 5 solution over any Martin-Baker alternative in the competition to select a next-generation ejection seat. This is all unsubstantiated opinion – why would Martin-Baker say that the new standards may not be realistic? Where are the facts? Thompson said: The ACES 5 seat has been piling up competitive wins recently – mostly on Air Force planes – so it seems to have an edge. Some of those wins have not been publicly disclosed, but it is known to be the Air Force’s choice for upgrading safety on the stealthy B-2 bomber, and United Technologies says ACES 5 is the only ejection seat that can meet standards established by Boeing for its new Air Force trainer. Boeing designed the trainer to accommodate a wide range of cockpit occupants, anticipating greater demographic diversity among combat pilots both at home and abroad. Did you know Martin-Baker won an actual head-to-head competition with UTAS for the Korean K-FX, which has identical safety requirements as the T-X? Did you know the B-2 and B-21 were both sole-source selections for UTAS. There was no win when you aren’t allowed to compete. As for T-X, that hasn’t been formally announced, but yes, Martin-Baker meets Boeing’s requirements, and our seat is flying in that prototype aircraft today. We’ve won actual competitions for T-6, T-38, and F-35 programs. If we don’t win T-X that will be the first time we’ve not come out on top in an Air Force program since UTAS purchased BF Goodrich. The difference though, is that Martin-Baker welcomes competition. We believe it drives ingenuity and safer ejection Seats for pilots, and that is our ultimate goal. Thompson said: Enhanced safety features aren’t the only selling point for ACES 5. United Technologies Aerospace Systems figures that once the new ejection seat is installed in B-2 bombers, it will only take 12 man-hours over a two-day period to conduct maintenance on the seat. The current requirement for the legacy seat installed on the bombers is over a thousand man-hours requiring 65 days. The modular construction of the seat greatly enhances maintainability, and the new seat is easily installed on aircraft such as the F-15 and F-16 fighters that currently use earlier seats made by United Technologies. Twelve hours is a surprising long time – that is the normal time frame per the Technical Order to perform a full three-year Seat inspection. The Martin-Baker Mk-18 seat can be installed down F-16 legacy rails in 20 minutes by two people without a crane or taking the canopy off. That’s actually documented by USAF officials. Also, MBA’s modular seat has been in service with the USAF for years, and was developed at Martin-Baker expense. UTAS could only complete modular seat development via Congressional earmarks and a sole source B-2 contract. Thompson said: Any innovation that can save money on life-cycle support is likely to be in high demand during the years ahead, given fiscal challenges that the military is expected to face. For the Air Force, though, the more important concern is delivering a higher standard of safety to pilots when they must eject from their aircraft. It is committed to providing airmen with the best warfighting technology in the world, and that includes safety features that enable them to go in harm’s way secure in the knowledge that everything possible has been done by their home service to protect life and limb. The final paragraph sums up exactly why the US Air Force needs Martin-Baker ejection seats. Safety. Look at the facts. Look at the record. Look at our history of saving lives. Look at the nimble and precise engineering. Last year alone Martin-Baker produced 520 seats for 23 different aircraft types. Of those seats, there were six distinct versions of our family of seats that had to meet and exceed the performance requirements levied by 16 separate aircraft manufacturers. We are leading the ejection seat industry into the future, and we’re saving lives, which is the ultimate goal. 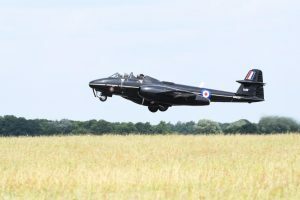 The Martin-Baker Meteor aircraft is back in action with its first UK test in 8 years at the Company’s test facility in Chalgrove, Oxfordshire. The high altitude ejection test carried out last week was a huge success, pictured here. The high altitude test capabilities at Martin-Baker are truly unique; we are the only ejection seat company across the globe that has the ability to carry out these remarkable tests. The Defence Aviation Safety Authority has approved Martin-Baker Australia’s application to be recognised as a Maintenance Organisation under DASR Part 145. Another huge step forward for Martin-Baker Australia! On Sunday 1st April 2018, the RAF will be celebrating their 100th anniversary. To celebrate this milestone, we at Martin-Baker will be looking back at our longstanding partnership with the RAF and the proud history we share together. Each week in the run up to 1st April, we will be posting a different image of each aircraft that has ever operated in the RAF as well as an image of the installed ejection seat. The first RAF ejection took place on 3rd July 1951 and since then 812 RAF lives have been saved, representing 11% of our current total lives saved of 7559. Lt Col Sanghyoun Park, from the Republic of Korea Air Force (ROKAF), pictured here with John and James Martin during his recent visit to the Martin-Baker headquarters. Lt Col Park’s visit was in celebration of the completion of US16E Ejection Seat No. 0340 which is destined for the first Lockheed Martin F-35A ROKAF aircraft “AW-1”.